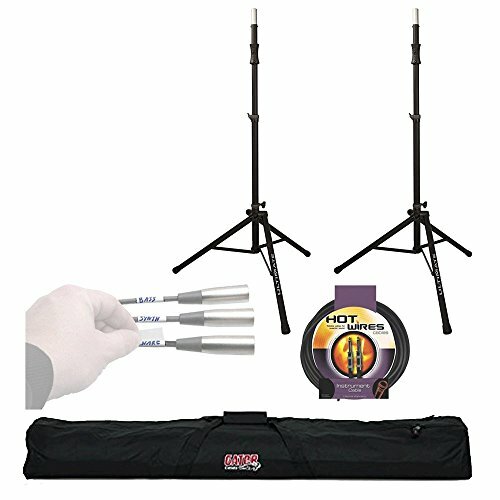 Ultimate Support TS-100B Speaker Stand (2 Pack) Lift-Assist Aluminum Tripod Speaker Stand + Gator Speaker Stand Bag for Two + ‘Label A Cable’ + Instrument 10 ft Cable – Super Ultimate Support Bundle! The TS-100B Speaker Stand from Ultimate Support makes it easy to raise and lower heavy loads, thanks to a internal shock telescoping mechanism. The air spring is under a 50 pound preload. This allows the stand to raise any speaker weighing under 50 pounds without any effort. Speakers heavier than 50 pounds will require some effort, however the gas spring mechanism will aid in the process. The stand is constructed from anodized tubing and has metal reinforced clamps to securely support more weight than similar stands. Despite being heavy-duty, the stand is surprisingly lightweight, and can be folded down into a compact and portable unit. Hosa Label A Cable Kit 60 Peel Off Labels - On Stage Instrument Cable, 10 ft. Ultimate Support TS-100B Air-Powered Series Lift-assist Aluminum Tripod Speaker Stand with Integrated Speaker Adapter + Speaker Stand Tote + Mounting Bracket + Strapeez – Top Ultimate Support Kit! !